And finally, videos of the Runway 3.0 senior collections, with Missy’s collection at 1:50 and 1:53, and Britt’s collection at 4:18-5:07. The physical collection are shown in the foreground, with the avatar models strutting their stuff on the LED screen behind the catwalk models. Almost every fashion design student wants to at least visit New York City, the fashion capital not just of the United States, but also the world. New York is where fashion is happening, particularly during one of our legendary Fashion Weeks. This particular Fashion Week is a little different: this is the last time New York Fashion Week will be held in the Tents at Bryant Park. The next time the designers and models come out, they’ll be further north in the City. We confess to being a bit sad to seeing the tents go, although we are sure the Bryant Park grass is breathing an enormous sigh of relief. What excites us about this particular Fashion Week is that our student interns from Buffalo State University will be joining us here in the City. Our big project for this semester is to develop their senior collection both as physical garments to be shown as part of the senior runway show and as virtual avatar apparel to be shown in virtual runway show. 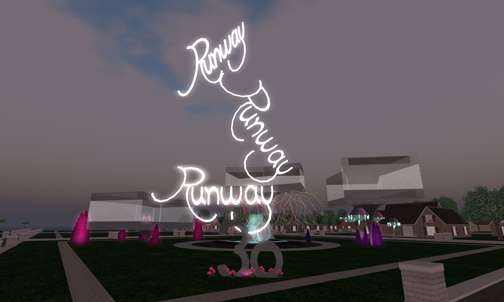 The theme of the senior show this year is Runway 3.0, and we’ve been tasked with adding various sorts of technology to their garment collection. We have agreed to serve as consultants in helping with the technical design aspects of the physical garments as well as with the development of their virtual garments and their virtual runway show. As part of the physical prototyping, we’re taking our students on a day-long sourcing trip to New York’s garment district, there to locate textiles, trims, closures, and other useful things. We have also arranged for them to volunteer at a Fashion Week designer event sponsored by Nolcha, where they will have a chance to be exposed to an industry event, to meet other students and of course, to mingle with designers and other industry insiders. We will be doing a lot of in-depth exploration of the technical design aspect of their collections: they need to finish this project with us not only with the mirror collections (physical/virtual), but also with a completed ‘story’ for their portfolio. And of course, we expect them to put together a report about their experiences, which will be blogged over on Professor Elaine Polvinen’s Virtual Fashion blog. Oh, yes, and while they are here, we’ll make sure we at least stroll past those big white tents. We don’t have time to take in a show, but we can at least take in the energy! 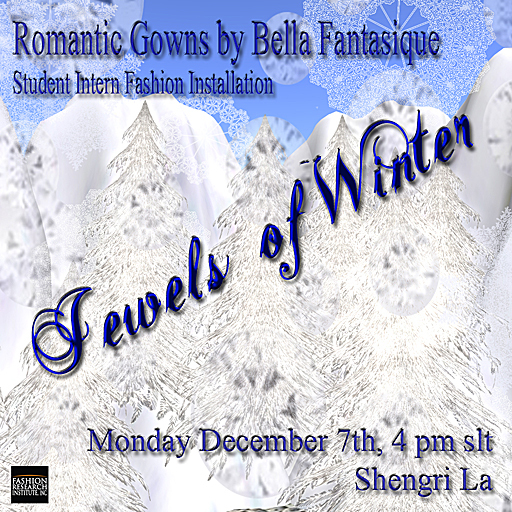 Please join us in the Fashion Research Institute’s Shengri La Hope region in Second Life on Monday, December 7th from 7-8 pm ET for the student intern fashion installation for Missy Lavecchia, an undergraduate fashion design student at Buffalo State University. Missy has been interning with us for the past nine months, and we are proud and honored to present her first solo fashion show. Missy will be showing formal gowns developed in rich jewel tones in honor of the holiday season. Her gowns, fittingly enough, will be presented in an opulent winter wonderland of snow and ice. A dozen gorgeous models and 4 handsome gentlemen callers will showcase Missy’s romantic gowns in a tableaux befitting the set. Please join us on Monday December 7th, at 7 pm ET/4 pm PT in Shengri La Second Life to celebrate the outstanding work of this star performer as her models show her work with aplomb. 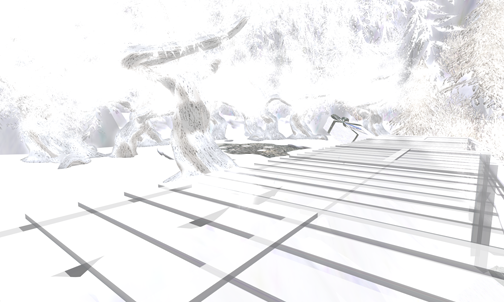 In the first weeks of my Second Life™ experience, I met a generous, warm woman who became one of my best friends in this mad maze of pixels. Lexa Pietersen was an ardent supporter of my early efforts to establish myself as an avatar apparel designer, and her support extended beyond just saying nice things. She went so far as to buy land for me and carry the tier on it for my very first store. Because of her support, I was able to move on from my first 512 meter plot of land in the mainland to become one of the top earners in Second Life with my brand Prim & Proper and ultimately owner of the Shengri La islands and a substantial RL corporation. It is now time for me to pay forward her kindness. To this end, my company, the Fashion Research Institute, Inc., has developed the Shengri La Vintage Marketplace on Shengri La. 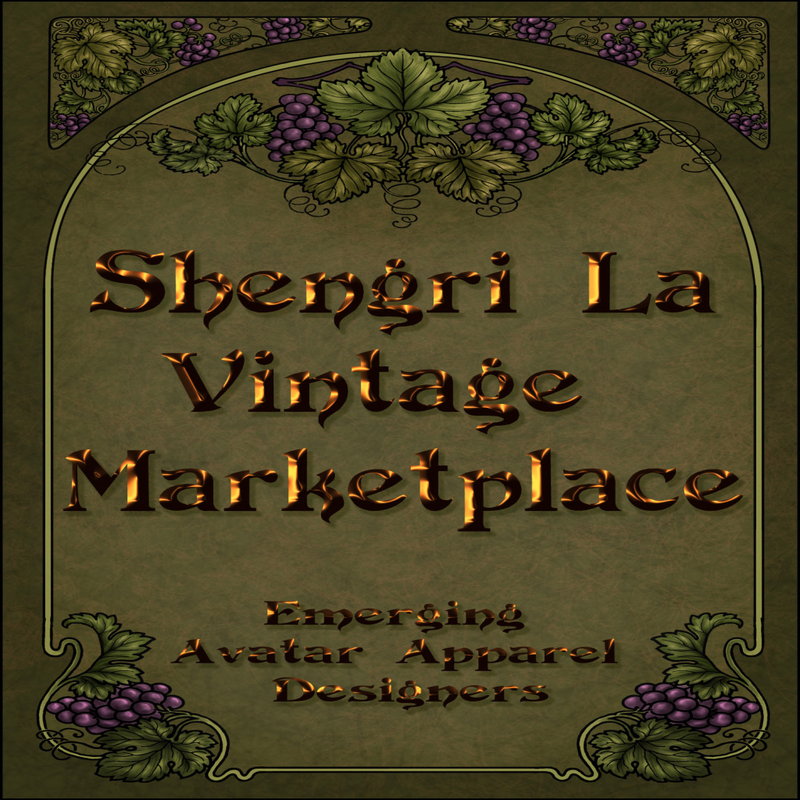 We will provide vendor space for 20 emerging avatar apparel designers on our Second Life Shengri La sim for six months free of charge. The designers are encouraged to build their brands, to sell their products through both their vendor prims and through the use of our catwalk system, and to grow their business. We hope that by providing these designers with incubation space on the beautiful Shengri La sims, that they will be able to grow their business to the point that they can acquire an appropriate flagship store elsewhere on the grid when their tenure with us is up. 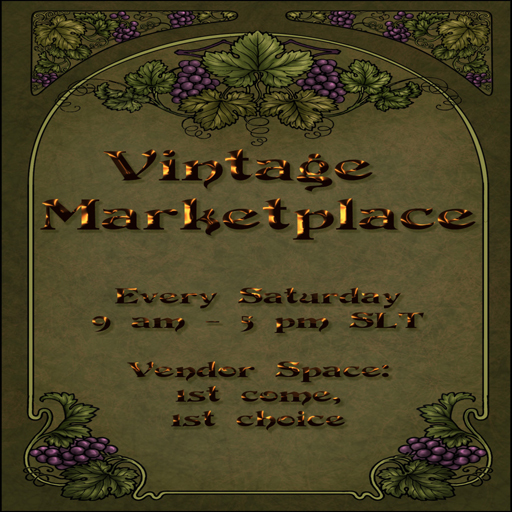 We are pleased to announce Michele Hyacinth as Curator of the Shengri La Vintage Marketplace for emerging avatar apparel designers in Second Life. Michele is responsible for managing the design selection process and overseeing the marketplace. For more information and details about the program, please contact Michele. You may also visit the Shengri La sims and pick up information from any of the Marketplace boards. To apply, send Michele a notecard with your name and best time to contact you in Second Life. Include a couple of sentences about the work you’re doing or hoping to do, and if you have any snapshots, add those to the notecard too. Then send it along to Michele, and she’ll be in touch! Best of luck to you, and may your dreams come true!